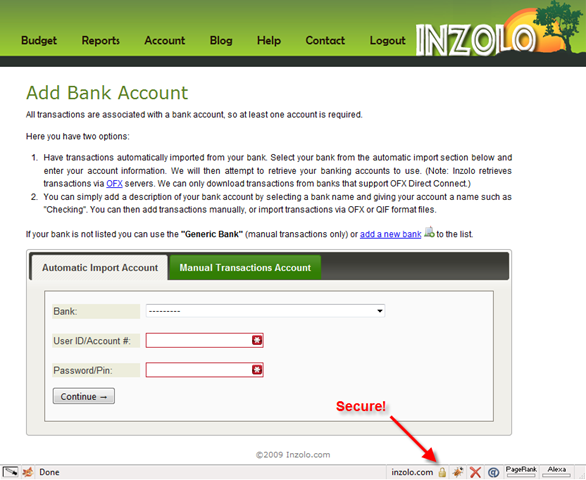 Inzolo is now ready for automatic transaction downloads. I’ve been using it with my bank and it works great. It order to release it I wanted to make sure that the site was secure when entering personal account information. So, may now notice when you go to enter a bank account SSL will be enabled. Inzolo uses the Open Financial Exchange (OFX) protocol, so this method will only work for supported banks. If your bank does not support OFX then you can continue to manually import transactions via a OFX (Microsoft Money) or QIF (Quicken) file. I’ve published a number of updates this morning, mainly dealing with bank accounts. I’m still in the process of getting automatic transaction downloads working. The good news it that I have in working on my development machine with my bank. I’m now working on getting bank information for the many banks that support OFX transactions. Also, I’m working on getting SSL set up so account information can be entered securely from your browser. I’ve updated Microsoft Money (OFX) and Quicken (QIF) import routines. I’ve found that quicken has various date formats and I’ve accounted for mm/dd/yyyy, mm-dd-yyyy and mm/dd’yyyy. Unfortunately there is no automatic easy way to distinguish between mm/dd/yyyy and dd/mm/yyyy, so if you are using and international bank that formats dates in the manner I suggest using Microsoft Money (OFX) format instead. If you do not have that option please let me know and I can offer another option on the import screen to select your date format.